Like many building materials, wood expands and shrinks. This is due to how much moisture is in the air. If there’s high humidity the cells within the wood will expand. If there is low humidity, the cells will shrink. Thankfully there is a way of predicting how much the wood will shrink or expand. The equilibrium moisture content (EMC) is basically the length of time it takes for your wood to accommodate to its new environment. It can tell you whether your wood is going to expand or shrink. 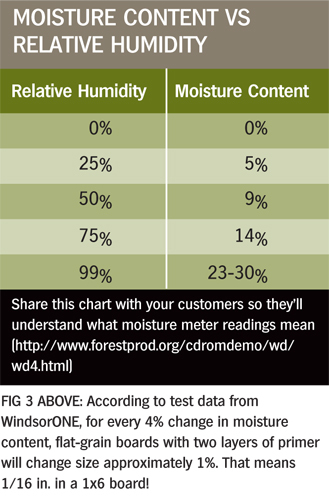 The EMC helps us understand the response wood has to relative humidity (RH). For example a change in Moisture content (MC) will cause a 12 inch wide maple board to expand or contact by at least ¼ inch. The graph below gives examples of MC versus RH. Wood, not only moves, because of its environment but because of many other factors. Here are six distinct factors as to why wood moves. Width of Material – The wider the board, the more the movement. Grain Orientation- Flat and quarter-sawn lumber can make a big difference in telling how much your wood will expand or shrink. Quarter-sawn shrinks and expands roughly half as much as flat sawn. Flat sawn shrinks and swells less in thickness while quarter-sawn shrinks and swells less in width. Moisture content of the wood at delivery – You should know the moisture content of the decking material when you receive it. This is measured using a moisture meter. 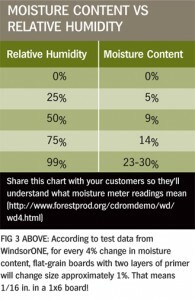 If you do not check your moisture meter upon your woods’ arrival then you will not know if your lumber has already began to move. Humidity inside and outside the structure. Homes in the US that lack humidity control, typically experience levels of humidity from 25 – 65% relative humidity. This will cause a 6% change in the MC of the wood. This means if you have a 12 inch wide board it will shrink or expand by a ¼ inch. Exterior humidity is different. Most of North America experiences humidity levels ranging from 60-70% in the summer and winter. If your material is delivered at 6-8% MC then it will experience more than a 2% change in size as it gets used to the EMC. Species affects the amount of movement – Most species of flat grain will change 1% for every 4% change in MC. 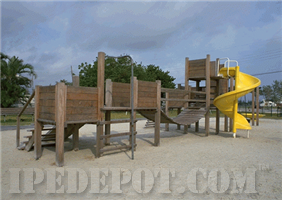 The movement values for quarter sawn lumber are approximately ½ the flat sawn values. Applied finish won’t stop size change- It will not stop the size change but it can slow the rate of moisture exchange down. Finished wood will eventually accumulate to EMC levels. Environment and wood species are the main reason as to why wood moves. When buying your lumber make sure to check your supplier’s environment and to calculate how much your wood will shift in size. If you want to play it safe, it’s best to buy your wood at least 3-4 days prior to starting your project, so you can let it get acclimated. 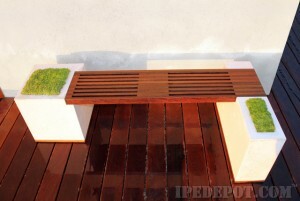 Ipe decks are great additions to any homes. Ipe is one of the strongest woods in the world and known to withstand the elements better than any other decking material. Ipe decks aren’t just strong because of how the lumber is, but because of the ways they are fastened together. There are three different types of deck fastening for Ipe decking; the hidden fastening method, the face screw/plug method, and the finish screw method. If you want a screw less and more modern-looking deck then you are going to be interested in the hidden deck fastening systems made by companies like DeckWise. This method uses strong molded plastics and hardened stainless steel clips that insert into slots cut into the edge of the deck board which then rests on the top of the joist. If your using pregroove decking, then this is the best method to use. It is very easy to install because no other tools are needed. Clips come in three different colors, brown, black, and gray. They also come in several different types; short, tall, kiln dried, extreme and regular. These clips are among the strongest clips on the market. The standard box of Ipe clips goes for $96 and there is 175 clips in each box. When using the IDeckWise Extreme fastening method, your deck screws must be installed at a 45 degree angle. Installing at a 45 degree angle will insure a much more stable deck. It will also help stop the possibility of splitting your decking. The second method, face screw/plug method, uses predrilled 1/8” pilot holes. These holes run completely through the deck boards and into the joist. You will then screw the deck boards down with stainless steel screws. Ipe plugs are then glued into 3/8” holes on the face of the board with waterproof glue. I’d recommend epoxy or gorilla glue. Epoxy is better for gluing posts and can be dyed. You would then gently chisel off any part of the extruding plug with a wood chisel and sand smooth. It may seem tedious but if you don’t want screws to pop up, covering them with ipe plugs is a great idea. The third method you can use to build your Ipe deck is the finish screw method. 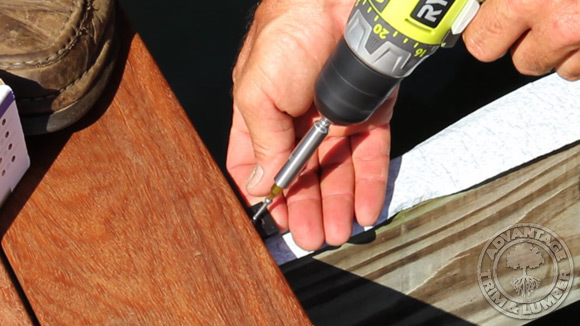 This method uses 8” stainless steel trim head screws which are screwed into the face of the decking at an upright angle. We recommend 2 per joist. This method also suggests screwing the screw in an upright angle. The trim head screw is very small and less noticeable. It also can reduce the risk of stripping your Ipe deck more than the standard square drive. If I had to suggest one method to use, it would be the Ipe clip fastening method. It uses the strongest clips and is the most stable. It also doesn’t leave any screw holes on your decks face or have the possibility for nails to pop up. 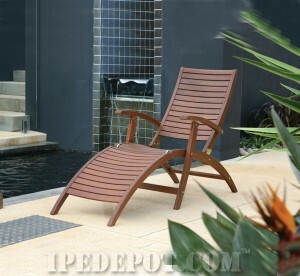 Ipe isn’t your average decking material. It can be used in more ways than one. Because of its brute strength and hardness it can be used in a number of ways. Just like the life span of Ipe, this list can go on forever. 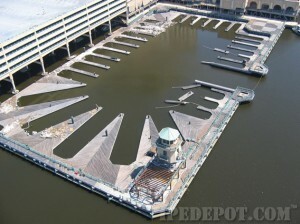 Ipe offers you a guaranteed 75+ year lifespan. That’s 60+ years more than your average teak. and decades longer than composites Ipe is also great with dealing with day to day activities along with natural disasters. No wonder cities like Toronto, Green Bay, and even Las Vegas use it for their heavy traffic projects. Not only can Ipe transform your backyard but also your home as well. With the help from Ipe ship lap or rainscreen siding your home can be recreated. It adds a little flair to your home while acting as a natural barrier to the elements assisting in keeping out unwanted pests.